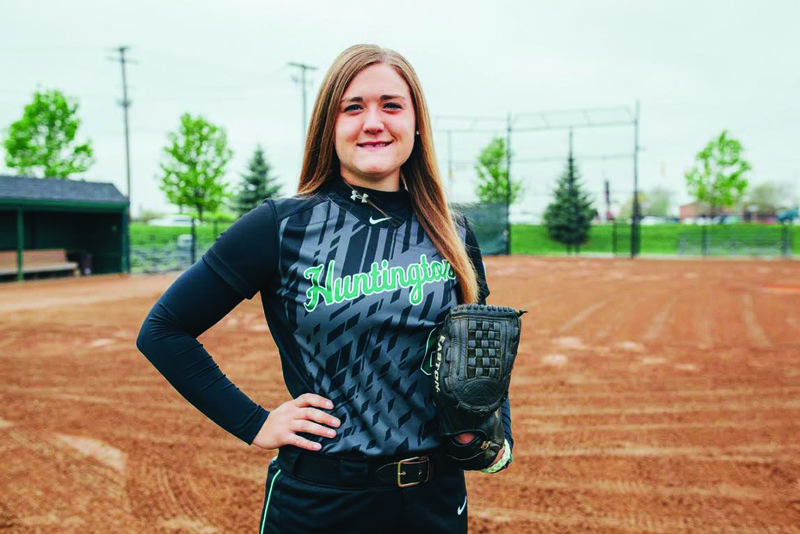 After four years of dominant pitching on the mound, Puterbaugh will soon wrap up her career at Huntington. Head coach Doug Gower said she's "among the best that has even been here." After 10 years on the mound, senior Emily Puterbaugh will soon be hanging up her mitt and cleats. “It doesn’t even feel real,” she said. Puterbaugh took the field as a T-baller and has returned each season since. It wasn’t until seventh grade when she began pitching. The next year, she joined a travel softball team, where she started hearing rumblings of playing in college. “It was definitely something that I wanted to do,” she remembered. Her high school accolades certainly communicate this mindset. Puterbaugh wrapped up her career at Summerfield High School in Petersburg, Mich., as a two-time state champion and three-time, all-state honoree. She said there was nothing like competing for a state title, though going to Nationals as an HU sophomore came close. When she began considering where she would spend the final four years of her career, she said it came down to where she could make an immediate impact on the mound. Puterbaugh pitched the most innings among the Foresters’ starting rotation as a freshman and finished the season with an ERA of 3.86 and a team-high 80 strike outs. Her sophomore season was highlighted by her team’s nationals appearance after they earned a bid by coming in second in the conference tournament to Taylor, who had already wrapped up a bid in regular season play. She posted an improved ERA of 2.86 and 28 more strikeouts than the season before. “It’s been very uphill,” Puterbaugh said of her career in forest green and white. Head coach Doug Gower echoed Puterbaugh’s story of improvement. Despite posting a losing record as a junior, she struck out 137 batters to go along with an impressive 2.98 ERA. With her performance on the mound in the Foresters’ first 44 games of her senior season, it’s clear Puterbaugh wants to go out with a bang. She currently boasts a 1.11 ERA, which is the second best in the Crossroads League. She leads the conference with an average of 7.23 strikeouts per game. She registered her 16th season win Apr. 22. Puterbaugh, who has a 2015 conference honorable mention, earned Crossroads League Pitcher of the Week for the week of March 28. She posted a complete-game shutout on Mar. 26 to finish the week with a .95 ERA. She followed the honor with a perfect game against Mount Vernon on Apr. 11. Puterbaugh said her team has its sight set on earning a bid to Nationals at the conference tournament. It’s also one of her personal goals for the season, as well as earning conference Pitcher of the Year. After four years of “consistent and determined” play — as Gower called it — Puterbaugh’s graduation will leave both a legacy and a considerable hole in the rotation.